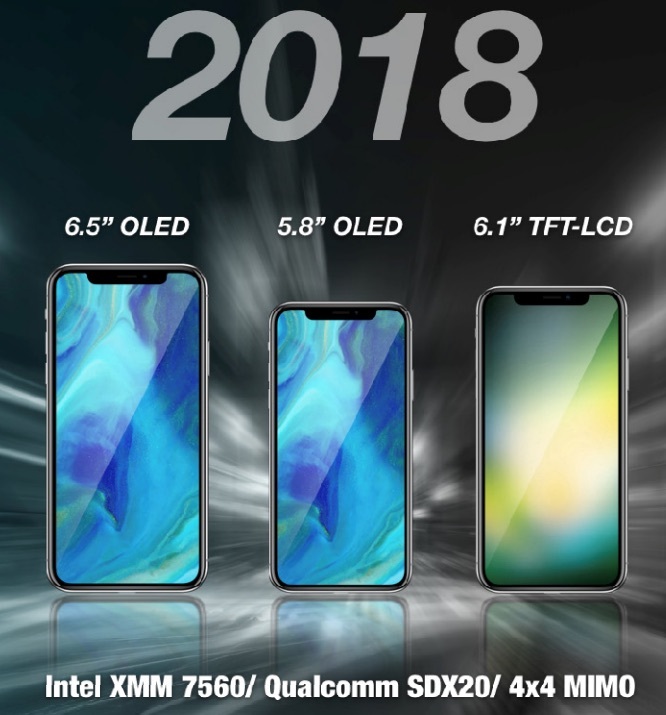 Apple's next-generation iPhone models released in 2018 will feature Intel's XMM 7560 and Qualcomm's Snapdragon X20 modems, enabling faster LTE transmission speeds, according to KGI Securities analyst Ming-Chi Kuo. New baseband chips from Intel & Qualcomm will significantly boost transmission speed of new 2H18 iPhone models thanks to supporting 4x4 MIMO antenna design: We believe that 2H18 new iPhones will upgrade baseband chips from Intel’s XMM 7480 and Qualcomm's MDM 9655 in 2H17 to Intel’s XMM 7560 and Qualcomm's SDX 20. As both new chips support 4x4 MIMO technology, compared to only 2x2 MIMO in 2H17, we anticipate LTE transmission speeds will increase significantly. We believe Intel will supply Apple with 70-80% or more of required baseband chips. 2H18 iPhone models won't only offer faster LTE transmission speed: We predict that at least one of the 2H18 new iPhone models will support dual-SIM dual standby (DSDS). Unlike existing DSDS phones, which commonly support LTE+3G connections, we believe next-generation iPhone models will support LTE+LTE connections, in a bid to enhance the user experience. BREAKING NEWS: The next model will have improvements from the current model. Maybe. They're all huge. Is it too much to ask for a normal HAND held sized phone? Well, it's about time as my iPhone X is already growing long in the tooth; and it doesn't even arrive until Monday. The 6.1" LCD model makes zero sense to have. You mean the 5.8" phone? It's the same size as the 4.7" iPhone 8, which is already a small phone. When I see that photo with the three different iPhone sizes rumored for next year, I wonder why they aren't making an iPhone SE X. Besides the provocative and unlikely name, I'd love a device that is only a little wider than the SE but with a full frontal ~4.7" display. Price it at $800 if you have to, I don't care! Another option would be to take exact same 4.7" display ratio from the iPhone 7, but with rounded corners. So it's wider than the SE but not taller yet still 16:9 and OLED. Also, has anyone asked how they would get LCD into that form factor? I thought you needed flexible OLED to do the corners properly. Sarcasm because of planned obsolescence.. And people expect Apple NOT to improve with next year's iPhones? You know the charade and pattern already. Will look the same but internal improvements. Tick-tock. ^ Repeat every step to fulfill that iPhone fix you have. We live in the ADHD era anyway. People may ask you about your newest iPhone and completely forget about it a minute later. We forget like over 90% of what we will see visually within the next minute. Most of us won't even remember what we had for breakfast by time someone may ask us by dinner time. Unless you have super memory like Marilu Henner. I wouldn't want that. I want to be like Jim Carrey in Eternal Sunshine of the Spotless Mind. Ignorance is bliss. I just wanna cry when I see bigger and bigger phones. FFS, not everyone has huge arms and wants huge phone. Even the current X has crazy big screen. Give me size of 8 screen in smaller form and I'll be super happy. Let the rest have plus sizes etc. Not everyone wants phablet ffs! No, the SE is a small phone. The 4.7” is a medium sized phone. That 6.5 iPhone in the photo absolutely trumps the 5.8. I know it's a render, but that's what I really look forward to, is the 6.5 OLED in Fall 2018. That 6.5 iPhone in the photo absolutely trumps the 5.8. I know it's a render, but that's what I really look forward to, is the 6.5 OLED. my first "dream phone" i am reallly liking the X but damn the X the size of a plus sign me up!!! !